BETHEL — On Jan. 23 at approximately 4:30 p.m., the Vermont State Police were dispatched to a single vehicle rollover crash on North Road in Bethel near Cleveland Brook Road. When troopers arrived they found the operator had been transported from the scene by a friend. Contact was made with the operator Jacob Forcier, age 19 from Barnard. Forcier suffered minor injuries in the crash and a friend transported him to Gifford Medical Center. He had been wearing his seatbelt. The crash occurred as Forcier was traveling north on the North Road in Bethel, and he lost control of his 2001 Dodge 1500 truck on a downhill curve below the intersection of Cleveland Brook Road. 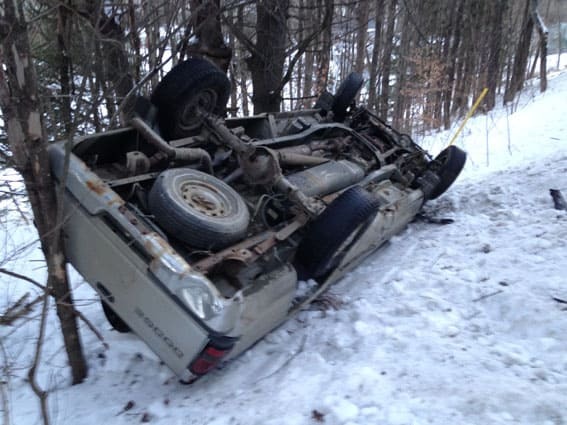 Forcier’s truck went over an embankment and rolled onto its roof coming to rest against several trees. A preliminary investigation found that defective vehicle equipment and road conditions contributed to the accident. Speed is not believed to be a factor. The truck suffered extensive damage including a broken driver window and windshield, driver side body damage, roof damage, and passenger side windshield pillar and door damage.